Alex Hampson won the Eye 5k last week and now leads the Peterborough Grand Prix standings after two rounds of the five-race series. 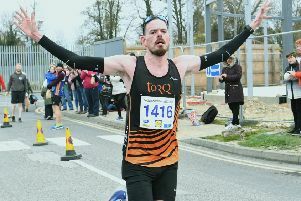 Despite a keen wind blowing across the Fenland course, some impressive times were set, and former Nene Valley man Hampson, now running for Cambridge and Coleridge, had enough left in his tank to move clear in the final kilometre to win in a time of 15:49. Runner-up Dave Hudson of BRJ came in eight seconds later, while Shaun Walton of Peterborough AC finished third with a 16:09 clocking. The lead trio broke clear early in the race, and there was a big gap to fourth place which was taken by Peterborough AC veteran Simon Mead with a time of 16:55. Stamford Striders Mark Popple finished in fifth spot in 16:58 while Martin Gichuhi led the Bushfield challenge in sixth. Nene Valley evergreen Sean Beard was the first Over 50 to finish, taking 16th position with a 17:53 clocking. Peterborough AC’s Chloe Finlay had a fine run when winning the ladies race in a new PB of 18:16. Nene Valley youngster Molly Peel finished an excellent second going round in 18:47 in what was her first outing over the distance. Sabrina Crothall ran 19:08 for third place with Peterborough pair Sarah Caskey and Hannah Chapman fourth and fifth. Nene Valley athletes completely dominated the junior 3km race taking the first eight places and also having two girls in the first three to finish. Race winner Kai Chilvers in10:25 was well clear of Sam Garner and Harry Hewitt who crossed the line in 10:40 and 10:47 respectively. Chelsie Bole ran 11:36 to finish ahead of Harborough AC’s Elizabeth Clapp whose time of 11:49 put her 10 seconds in front of third-placed Lottie Hemmings.